The Books of Kings were meant to keep Israel faithful, using lessons from history. The books describe the misfortunes of their unfaithful kings, and the good fortunes of their faithful kings. Elisha is a faithful prophet who criticized unfaithful kings. Several miracles bolster Elisha's credentials. The Letter to the Ephesians is about God's long-secret plan, now revealed, to reconcile Jews and Gentiles. These ancient enemies have been united in Christ. Today's passage instructs a Gentile Christian community on some finer points of living together. In prior weeks, we've been reading Saint Mark's gospel, up to the miracle of the loaves and fishes. We switch today to Saint John's more detailed version of that story. In the next four Sunday's we'll here from John Jesus' whole teaching about the bread of life. Our Liturgical Setting: This year, Sunday by Sunday, we've been reading Saint Mark's gospel. Last Sunday we came to the brink of the point where Jesus, after teaching a crowd of thousands at great length, miraculously feeds them, multiplying a few fish and loaves of bread. But the lectionary switches to the account of this event in the Gospel of John, chapter 6, with its amplified teaching about the bread of life. 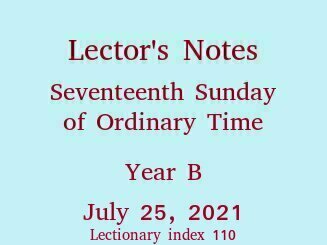 (We'll spend five Sundays in this single chapter; the lectionary reserves readings from Saint John's gospel for the most solemn parts of Christmas, Lent and Eastertide annually, and this stretch of ordinary time every third year.) The first reading prepares us for the gospel today by describing a similar miraculous feeding of many from a few loaves. The Historical Situation and Theological Background: The Books of Kings were written well after the events they describe by an author who had this intent: His main interest is in keeping his audience faithful to the Lord. So he tells the story of each king with emphasis on how the king was or was not faithful. "The faithful prosper; the unfaithful pay for their defections," as the Introduction to 1 Kings in The New American Bible explains. Unlike the hot and cold kings, Elisha, "the man of God," is reliably faithful. Several miracle stories in chapters 4, 5 and 6 of 2 Kings bolster his reputation. Proclaiming It: Just tell it like the straightforward story that it is. The name of the man of God is pronounced "eh LISH uh" with a short e sound in the first syllable and short i sound in the second. He should not be confused with Elijah ("ee LYE juh"), his mentor, who disappeared two chapters earlier. The fellow with the few loaves came from Baal-shalishah, pronounced "BAH ahl shah LEE shah." Actually, it matters not how you pronounce the town's name; just don't improvise when you're actually proclaiming this. To the congregation, you should sound like you know what you're talking about, and that you believe what you're doing is important enough to prepare for. The Historical Situation: On the Fifteenth Sunday and Sixteenth Sunday of this season, we established the new unity of God's once separated peoples, the Jews and the Gentiles (the latter including the Ephesian addressees of this letter). Here Paul (writing from prison) encourages them to live out the consequences of their unification. We might paraphrase thus: "You have only one religion, so live like one family." Proclaiming It: Let your voice portray the high emotion in Paul's pleading. Remember how you've felt when two people you love show their bitterness toward each other. Paul's efforts to awaken the Ephesians to their unity in Christ were part of the mission that put him in prison. He doesn't want them to waste the blessing for which he has put himself at such risk. The video is an excerpt from a work by the artist Corinne Vonaesch (Swiss, born 1970). The voices are reciting most of the prologue of Saint John's gospel, and verses from John's account of the wedding at Cana. The YouTube/Google transcription of the speech into French text is only partly correct. Click here for more about her 55-minute DVD Colors of the Gospel: The Gospel of John in Images, Words and Music, including a six-minute preview.